Here is another great frugal gift or idea to use all year round – Room & Linen spray. 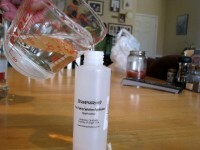 Making linen spray is so simple to do and much less expensive than going to a department store to buy it. You know exactly what is being sprayed onto your linens or in your room and have comfort in knowing that only pure natural products are being used. The toughest part of making these is deciding what scents to use. A small (1/8th oz) bottle of essential oil goes a long way! Use 4 oz. clean spray bottle (Michael’s craft store – $1.19) with fine mist spray nozzle. In a small bowl, mix essential oil and vodka together. The alcohol works as an emulsifier, allowing the oil and water to mix evenly. 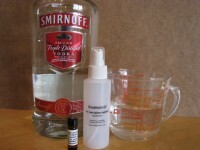 Pour the essential oil-vodka mix into the spray bottle, add the 1/2 cup filtered water, and shake. Make sure to shake well before each use. Another great use for the spray: to use in your car. I love using the vanilla spray in my car after it’s been hand washed (in my driveway – hopefully by my children :)). It’s a great way to get the “I’ve been to the car wash” feel without paying the money. 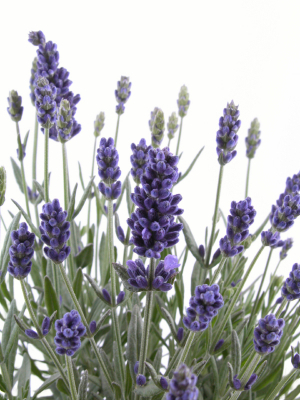 Note: you may need to increase the essential oil to 10 drops for a more concentrated scent. 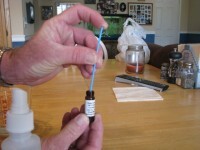 For more great essential oil blend ideas visit my Examiner.com article. For more Christmas gift ideas try Frugal Christmas Gift Ideas and Christmas Gifts under $10. This entry was posted in Tutorials and tagged frugal christmas gifts, homemade Christmas gifts, homemade linen spray on 2009-11-29 by Christine.